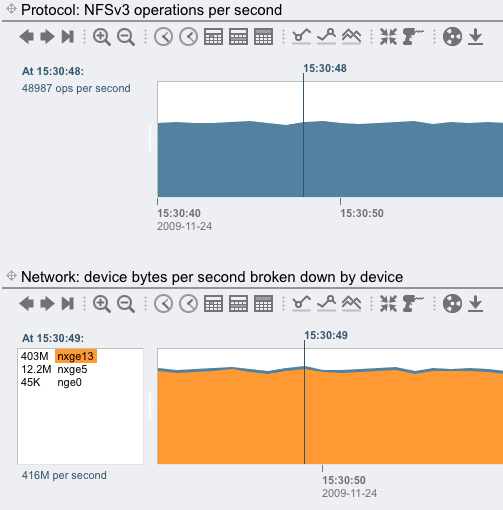 Monitoring Direct NFS with Oracle 11g and Solaris… pealing back the layers of the onion. When I start a new project, I like to check performance from as many layers as possible. This helps to verify things are working as expected and helps me to understand how the pieces fit together. My recent work with dNFS and Oracle 11gR2, I started down the path to monitor performance and was surprised to see that things are not always as they seem. This post will explore the various ways to monitor and verify performance when using dNFS with Oracle 11gR2 and Sun Open Storage “Fishworks“. why is iostat lying to me? “iostat(1M)” is one of the most common tools to monitor IO. Normally, I can see activity on local devices as well as NFS mounts via iostat. But, with dNFS, my device seems idle during the middle of a performance run. From the DB server perspective, I can’t see the IO. I wonder what the array looks like. what does fishworks analytics have to say about IO? The analytics package available with fishworks is the best way to verify performance with Sun Open Storage. This package is easy to use and indeed I was quickly able to verify activity on the array. There are 48,987 NFSv3 operations/sec and ~403MB/sec going through the nge13 interface. So, this array is cooking pretty good. So, let’s take a peek at the network on the DB host. nicstat is wonderful tool developed by Brendan Greg at Sun to show network performance. Nicstat really shows you the critical data for monitoring network speeds and feeds by displaying packet size, utilization, and rates of the various interfaces. So, from the DB server point of view, we are transferring about 390MB/sec… which correlates to what we saw with the analytics from Fishworks. Cool! Ok, I wouldn’t be a good Sun employee if I didn’t use DTrace once in a while. I was curious to see the Oracle calls for dNFS so I broke out my favorite tool from the DTrace Toolkit. The “hotuser” tool shows which functions are being called the most. For my purposes, I found an active Oracle shadow process and searched for NFS related functions. So, yes it seems Direct NFS is really being used by Oracle 11g. There are a set of V$ tables that allow you to sample the performance of the performance of dNFS as seen by Oracle. I like V$ tables because I can write SQL scripts until I run out of Mt. Dew. The following views are available to monitor activity with dNFS. v$dnfs_servers: Shows a table of servers accessed using Direct NFS. v$dnfs_files: Shows a table of files now open with Direct NFS. v$dnfs_channels: Shows a table of open network paths (or channels) to servers for which Direct NFS is providing files. v$dnfs_stats: Shows a table of performance statistics for Direct NFS. With some simple scripting, I was able to create a simple script to monitor the NFS IOPS by sampling the v$dnfs_stats view. This script simply samples the nfs_read and nfs_write operations, pauses for 5 seconds, then samples again to determine the rate. Excellent! Oracle shows 48,000 NFS IOPS which agrees with the analytics from Fishworks. Consulting the AWR, shows “Physical reads” in agreement as well. so, why is iostat lying to me? iostat(1M) monitors IO to devices and nfs mount points. But with Oracle Direct NFS, the mount point is bypassed and each shadow process simply mounts files directly. To monitor dNFS traffic you have to use other methods as described here. Hopefully, this post was instructive on how to peel back the layers in-order to gain visibility into dNFS performance with Oracle and Sun Open Storage. The Solaris x86-64 port of Oracle Database 11g Release 2 can now be downloaded from OTN. Get it while it’s hot!